November 1st was international self-portrait day. I got a little carried away on my self-portrait, because one of my favorite things to paint is human skin. Working on this gave me the idea that I could do a little tutorial for you guys. 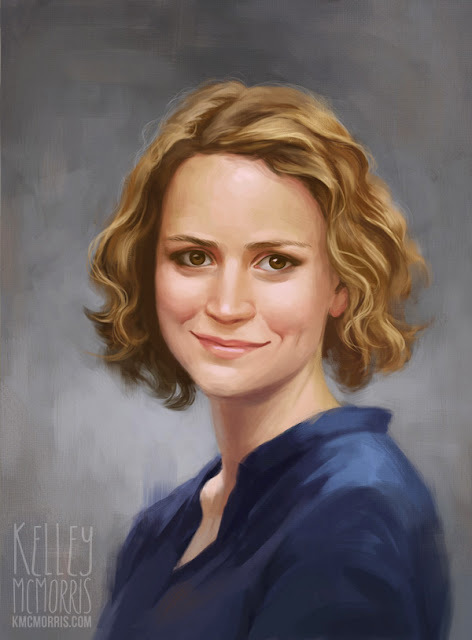 I hope this helps you paint portraits, and I'm sorry about how many times you're going to have to look at my face in this post. 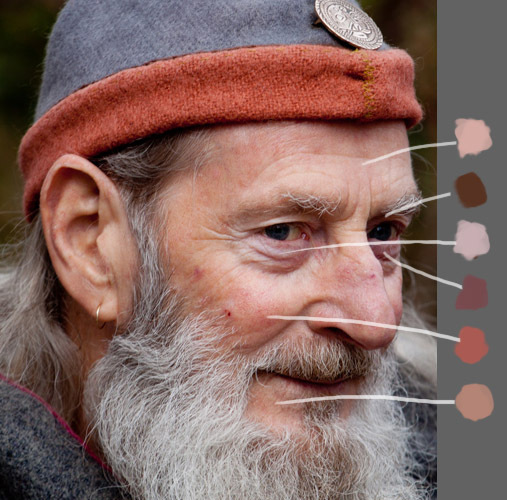 skin reflects colors from the environment around it. 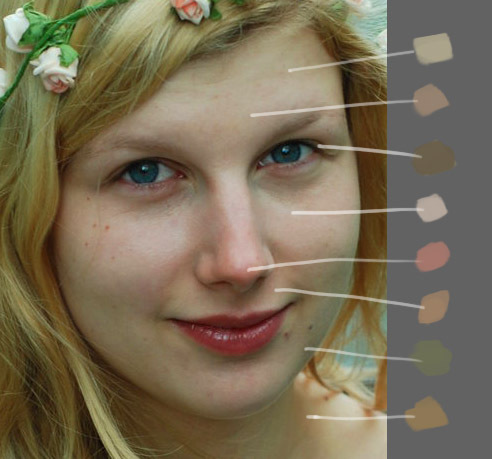 The mistake most newbies make is to choose one color for the skin, then use darker and lighter values that same color. This limited palette results in something like this. It looks like I'm wearing wayyyy too much foundation. Or like I'm wearing artificial android skin. I AM KELLEY BOT. RESISTANCE IS FUTILE. So how to we bring some life into this freak of nature? We need to add some variation in color to this face - but where do we put those colors? The colors in people's faces tend to follow a pattern. In general, people tend to have yellow tones on their forehead, the sides of their face, and in the neck. They tend to have pink in the cheeks, nose and ears, blue underneath the eyes, and a bit of blue around the chin. Remember this is a simplification and a generalization. Everyone is different, and their skin will look different in various light and environments. Some people will have more greenish tones instead of yellow. Some people have yellow under their eyes rather than blue. People with the darkest of dark skin tones may not seem to follow this map very much at all. The best thing to do is to observe faces for yourself. 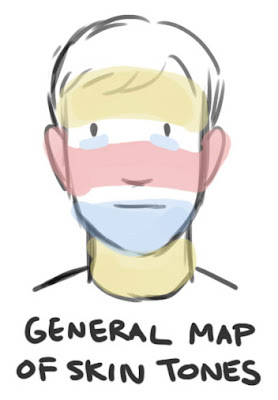 Let's apply this map to my portrait and see what we get. Now, you don't want to go overboard with this, or else you're going to make your subjects look like they have jaundice and sunburns and five o'clock shadows all at the same time. Getting the right amount of variation in tones, not too much, not too little, takes practice. One way to improve is to be constantly observing the faces of people around you, in tv shows and movies. 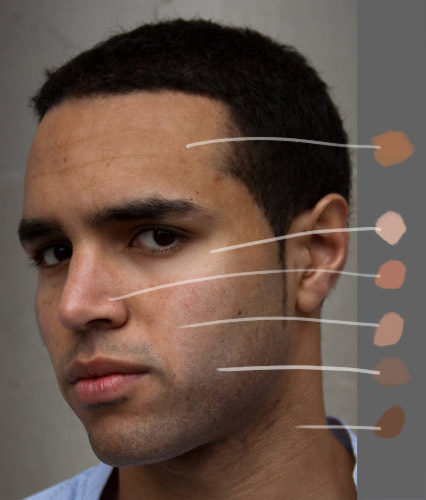 Caution: observing people's skin tones can be weirdly addictive. Seriously, when I watch movies, I'm only half paying attention to the plot. The other half of my brain is analyzing the actors' skin tones. This is probably why I find a lot of movies hard to understand. 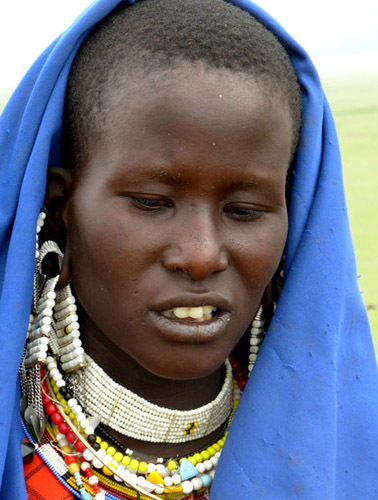 As far as I can tell, people with extremely dark skin tones don't have as much color variation in the skin itself. However, their skin still picks up colors from the environment. So there you have it. 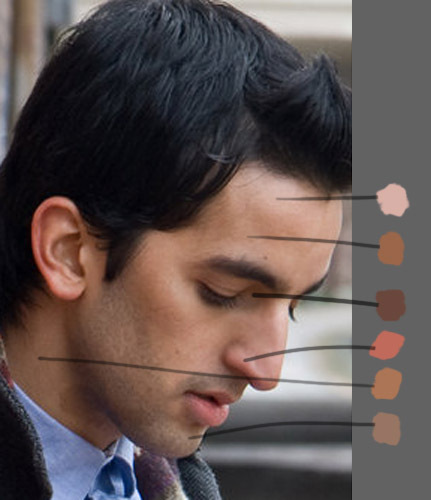 Vary up your skin tones, artists. Start observing people's faces. Get distracted during movies. I'm an android. 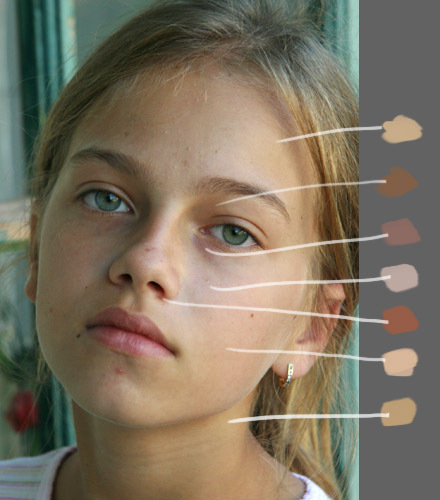 A lot of what I learned about skin tones comes from Lauren Cannon's excellent Deviantart tutorials on skin tones. Check them out here and here. So I really like this tutorial, but it's very white. I thought that the picture you posted contains quite a variety of skin tones. Nice! I am going to look and see if you blogged about mixing flesh tones! Before I ask you to create one😄. Thank you! You are very pretty. Have been retired from the commercial art biz for some time now, but I've noticed that the brain and the eye never really retire. 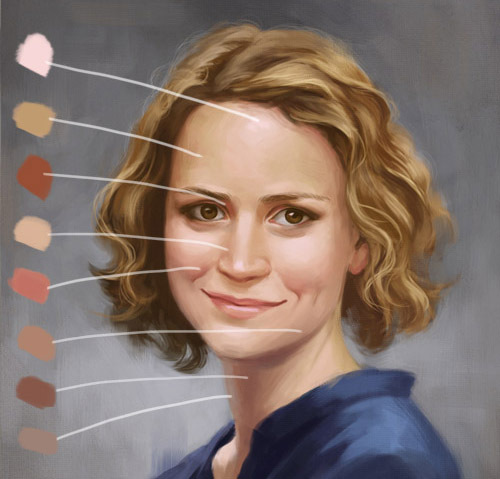 Every human face I see, live or in media form, relates to me as an illustration snippet, or as a line study, or as a color/hue/tint blocking study, or as a light/dark mood tone. Your tutorial reminds me of an era in discovery (a hunnert yar ago) when I was laboriously attempting to climb out of student figure studio mode. That means climbing out of two dimensional B&W line drawing and tone shading mode. Into the third dimension, COLOR. 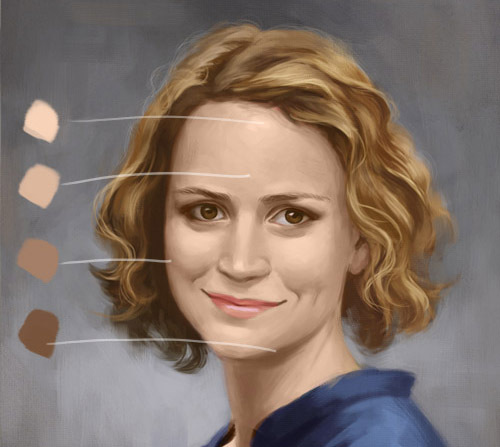 Skin tones were a huge color challenge. 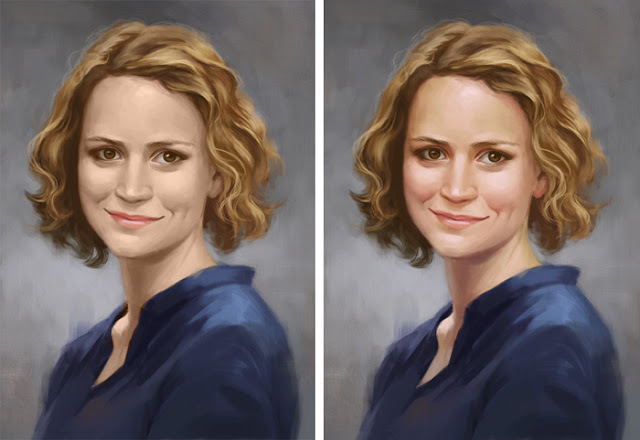 I want to suggest that successfully capturing and duplicating skin tones is a bit like capturing an extra, or fourth, dimension. Physicists have something called String Theory, about extra dimensions in all matter that resonate from the vibration of ultra-small-particle strings. The extra dimension I speak of happens when appropriate color shades work with each other to create a vibration, a sort of artificial-but-believable tension/suspension. A visual resonance. Your tutorial clearly shows that color resonance working. How'd I do with the word picture?